No one really understands what goes into being a teacher unless you become one. There are countless hours that go into preparing for each class. There is the duty to find clarity and simplicity in regards to translating something complex and overwhelming. There is a juxtaposition of having a love of a subject with the passion to express it fully and unadulterated. I have been teaching Anatomy and Myology at Tri State College of Acupuncture for four years now. I have witnessed countless of “a-ha” moments which makes every teacher proud to watch the coming together and integration of information into logical thought patterns. With that being said, I was blessed and astounded by a song that was written and sung for me by one of my students (Oded Schneiderman) in the class of 2010 from Tri State College of Acupuncture. I share it with you here, on my blog, as THE proudest and most gracious teacher! I titled it: “Oded’s Fascia Song”…an “ode” to my persistent and relentless teachings on the importance of understanding the connective tissue system (a.k.a. fascia), scar tissue and twitch responses from trigger point dry needling. A sophisticated double helix of vital information indeed. But our sense of olfactory pleasures! Jane Becker, a composer and solo pianist, celebrated her 50th birthday at the dermatologist, paying $1,500 for shots of Restylane and Botox. But three months later, their wrinkle-smoothing effects wore off. So, she turned to a less-artificial youth tonic: facial acupuncture.Like many women who have tried acupuncture in pursuit of beauty, Ms. Becker hoped that having needles strategically inserted into her face would be cheaper and last longer than her birthday injections.Ms. Becker, now 53, started with 10 sessions in five weeks ($1,000) and has gone for monthly maintenance since ($105 a session).Acupuncture didn’t end up being much of a bargain, but it pays in other ways, she said.”I can really see a difference in my face,” said Ms. Becker, who sees Steven Sonmore, a licensed acupuncturist in Minneapolis. “It looks younger, smoother, brighter and uplifted.”Early adopters like Ms. Becker first spread word of the virtues of a so-called acupuncture face-lift. Then before the 2005 Academy Awards, a crew of facial acupuncturists descended on Soho House, a makeshift celebrity hangout in Los Angeles, and A-listers jumped at the chance to transform their skin from the inside out. Now, thanks to more robust marketing, cosmetic acupuncture has caught the attention of more of the wrinkled public. Its holistic approach appeals in particular to women who want to slow signs of aging, but don’t want to undergo surgery or to inject chemicals.Whether it is called facial rejuvenation, acupuncture face-lift or cosmetic acupuncture, the aim is to tackle wrinkles, muscle tension that may be causing unsightly lines, as well as systematic issues standing between you and glowing skin. Just as with traditional needling, putting needles on acupuncture points stimulates the body’s natural energies, called qi, but with added benefits.Whether cosmetic acupuncture works has yet to be proved. Some randomized, controlled studies have shown that acupuncture is an effective adjunctive treatment for hypertension, chronic pain, headaches and back pain. But there is no peer-reviewed research demonstrating that acupuncture diminishes wrinkles.Still, an industry devoted to needling for youthful skin has grown in recent years.”There’s a rise in interest all over the country,” said Martha Lucas, a licensed acupuncturist who helped create the Mei Zen cosmetic acupuncture system in 2003. She teaches a dozen seminars annually to rooms of more than 30 budding facialists. “L.A. used to be the biggest market. But now we get people from the Midwest calling.”Practitioners of this style of cosmetic acupuncture called Mei Zen (“beautiful person” in Chinese) offer their services in 16 states.Mary Elizabeth Wakefield, a licensed acupuncturist who headed the 2005 Oscars event, has trained more than 2,000 teachers in 40 states in her technique: constitutional facial acupuncture. This year to date, she has trained almost 1,200 practitioners, up from 100 in 2001, she said. “For centuries, the ancient Chinese have promoted health and beauty,” Ms. Wakefield said, “but we’ve taken it to another level.”Part of the reason is savvier marketing: Ms. Lucas’s monthly seminars include pointers on taking effective before-and-after pictures, and creating fruitful relationships with dermatologists. She even passes out T-shirts that proclaim “Cosmetic Acupuncture Works.”A half-dozen women interviewed for this article said they have seen puffiness decrease, under-eye bags disappear and lines diminish or soften.Dr. Richard G. Glogau, a clinical professor of dermatology at University of California, San Francisco, said these changes were quite possible. “It’s obvious that people carry around a lot of muscle tension in their face, which gives them frowns and wrinkles,” he said. “My take on this is that they are producing relaxation in the muscles.”But Dr. Glogau doesn’t believe that facial acupuncture can increase collagen, another claim of some practitioners. Fall allergy season is about to creep up on us and with this comes the onset of rhinitis, sinusitis, post nasal drip, runny nose, watery eyes, dry mouth, sinus and chest congestion, scratchy throat….. This blog is dedicated to understanding the importance of clearing environmental pollutants from our nasal passages. There are tiny hairs that line the inside of the nose. These hairs help to trap polluted debris from the environment before they enter into the sinus cavities above the bridge of the nose and skull. Unfortunately, those of us that live in the New York metropolitan area (a.k.a. the concrete jungle) are being bombarded by exhaust fumes, dirt and city grime. These particles can irritate the nasal cavity. The irritation will then cause an inflammatory reaction and the body’s immune system will kick into gear and create more mucous. This mucous will coat the tiny hairs and the lining of the nose in order to defend against any more invading pathogens. Environmental allergens including pollen, dust, animal dander, weeds, etc. will also cause the body to react with an immune response that will result in sinus congestion and mucous production. 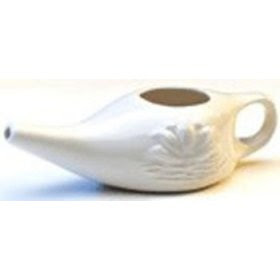 I was introduced to using a Neti Pot 5 years ago and I have been a daily fan ever since. The learning curve takes up to two weeks, so be patient! Even if you feel like you are drowning yourself, keep up! It will be worth it in the long run! 2. Use organic sea salt (I prefer the finer grade salt). You will use 1/4 tsp in the pot. So, the hot weather is now in full force and we are losing fluids quickly. We must replenish the fluids lost but we are bombarded on our supermarket shelves with a wide variety of “vitamin waters”, “smart waters”, “electrolyte waters” and the ever so present tap water that has been bottled up and sold in expensive stores that has the word “organic” or “natural” stamped on it so that we feel justified for spending so much money on WATER! I understand that some of us prefer to taste something other than plain water. If that is the case, myself included, why not add a half of a lemon or lime to your glass? Now, why add the whole half of lemon to your water instead of just squeezing the juice? Research supports that the essential oils extracted from the rind of the lemon has the following medical properties: antitumoral, improves microcirculation, immune stimulant (increases white blood cells), improves memory and enhances relaxation. Lemons, limes and grapefruits are low in sugar. Although they are chemically acid, they have an alkalizing effect when metabolized in the body. Using these fruits will help to maintain a proper pH of the body. Remember…highly acidic tissues have more inflammation. Inflammation means more irritation and typically pain. So, those of you that suffer from muscular “pain”, drink less coffee (highly acidic) and more fresh lemon, lime or grapefruit water (highly alkanizing). Lastly, after acupuncture or deep tissue massage, it is important to drink water. The reason for this is to flush the body of the residual toxins expressed from the tissue during the procedure. Acupuncture can cause the muslces to release lactic acid (this is the tissue irritation or “soreness” one often feels after a strenuous workout). So, in order to metabolize and flush this acid more quickly, water must be drunk. Now, add your lemon, lime or grapefruit and you have improved microcirculation! One can overhydrate, particularly those on medications that specify monitoring liquid consumption, so drink accordingly if you are under the guidance of a physician!